Individual songs are available for $5/song (if sent by PDF) or $10 (if sent via USPS). Check or money order only. $49.95 (includes shipping and handling) Check or money order only. 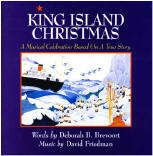 Can’t get King Island Christmas tunes out of your head? 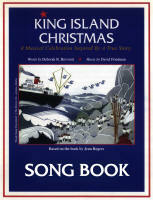 Now you can learn all the songs and sing along too with the King Island Christmas songbook. Contains the complete piano vocal score.